Nothing is more essential to our sense of well-being than the ability to comfortably draw breath. The doctors of Heart & Lung Associates, P.C., with a combined experience of more than 50 years in the treatment of respiratory ailments, have long devoted themselves to seeing that this most critical of human needs, is satisfied for as many as possible. Since 2001, Heart and Lung Associates, P.C. has been a treatment center for pulmonary disease victims of the 9/11 World Trade Center bombing. We are also involved in the "Research Foundation: The City of New York" study for the long term pulmonary affects on 9/11 responders and victims. Also, the Pulmonary Functions Lab at Heart and Lung Associates is one of the primary New York Metropolitan area sites for the Eli Lilly and Mankind Corporation studies looking at the long term pulmonary effects of inhaled insulin as a treatment for diabetes. Interventional pulmonology is a field within pulmonary medicine that involves the use of procedures such as bronchoscopy to treat pulmonary disease. SleepCenterNYC.com doctors include interventionalists who are skilled in the use of such techniques for endobronchial biopsy, trachial and bronchial stent placement, broncho-aveloar lavage, transbronchial needle aspirations and laser bronchoscopy. The pulmonary specialists a Heart & Lung Associates, P.C. are able to provide a wide variety of on-site testing for patients with respiratory conditions. Pulmonary Function Tests(PFTs), including spirometry, methacholine challenge, "Six Minute Walk," chest sonography and ultrasound and thoracentesis are all performed within our Bayside facility. To learn more about any of these, select from the panels below. Pulmonary functions tests measure how much air you can move in and out of your lungs, how quickly you are are able to move the air and how effectively your lungs give oxygen to your blood and take away its carbon dioxide, (CO2). For this test, you sit inside a small airtight room called a plethysmograph booth and breathe through a mouthpiece while pressure and air flow measurements are collected. 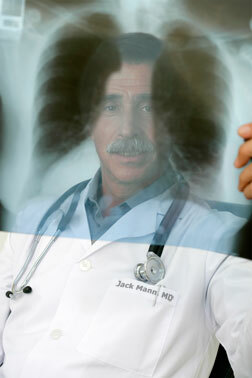 Pulmonary function tests are done to diagnose the nature of a patient's breathing problems. They are very effective at detecting and measuring the effects of asthma, cystic fibrosis and COPD, and can detect the effect of inhaled substances on lung health, (e.g. occupational exposure to chemicals). PFTs are also used to evaluate lung function prior to surgery and to evaluate the effectiveness of treatments being given for respiratory diseases. A methacholine challenge test (or, bronchial challenge test) is a test that helps in the diagnosis of asthma. The patient is asked to breathe in methacholine (or histamine), which will produce bronchoconstriction, or narrowing of the airways. The degree of narrowing can then be measured using spirometry. People with hyperactive airways, such as asthmatics, will react to lower doses of drug than would others. In order to assess the reversible the condition is, a bronchodilator may be administered to counteract the effects before repeating the spirometry, ( a "reversibility" test). This type of test can help to distinguish between asthma and COPD. The bronchial challenge test is physically demanding, and the inhaled drug could stimulate the airway sufficiently to cause violent coughing, making spirometry difficult to perform. This test should not be used in patients with severe airway obstruction since it could worsen the obstruction. Determining the physical capability of a person with COPD is important to the planning of his clinical treatment. Because many are unable to perform more standard treadmill-based exercise tests, the 6-minute walk test was developed. This test is generally done at the start of a pulmonary rehabilitation program or to evaluate a patient for lung surgery. It measures the distance a patient can walk quickly on a flat, hard surface in 6 minutes and reflects an individual's ability to perform regular daily activities. Most 6-minute walk tests will be done both before and after therapeutic intervention to determine if the patient has seen improvement with the therapy. Thoracentesis (pleural tap) is a procedure done to remove fluid or air from the pleural space, either to make a diagnosis of illness, or to treat a problem within that space. A cannula is carefully introduced into the chest after placement of local anesthesia. The location that is best for the introduction will vary depending upon the location and nature of the problem. This procedure is needed when unexplained fluid accumulates in the chest cavity outside the lung. In nearly all cases analysis of fluid removed will provide useful information. If there is a large amount of fluid present, then this procedure may also improve the comfort of the patient comfort and make breathing more efficient. The most common causes of pleural effusions are cancer, congestive heart failure and lung infection (pneumonia). Once fluid is removed it is first tested to see if it is a "transudate" or "exudate." An exudate is any fluid that filters from the circulatory system into lesions or areas of inflammation. Its composition generally includes dissolved solutes of the blood, such as plasma proteins, white blood cells, platelets or red blood cells. A high amylase level indicates either acute or chronic pancreatitis, pancreatic pseudocyst that has dissected or ruptured into the pleural space or cancer. The number of white blood cells can give an indication of infection and specific subtypes of white cells can also give clues as to the type on infection. If the effusion is indeed caused by infection, cultures of the fluid may yield the identity of the infectious organism. Cytology is an important in identifying effusions produced by malignancy. The most common causes for pleural fluid are lung cancer, mesothelioma, and tumors that have spread from elsewhere. "Pulmonologists are experts in the diagnosis and treatment of all respiratory illnesses, particularly those that result from derangements of the major airways and lungs. Their knowledge of chest mechanics and respiratory physiology makes them particularly expert in the management of critically ill patients and those requiring intensive care and mechanical ventilation."